Hamsters have come a long way from the simple monotone short-haired variety. You can now purchase hamsters of multiple colors, and you can get them hairless, short-haired and with long silky hair that sticks out like they have a bad case of static electricity. Teddy bear hamsters can be almost any color now, and in many color combinations. It used to be that all hamsters were "golden." Golden or light brown was the general color of the entertaining little rodents, but actual coloring could vary from hamster to hamster. "Golden" could apply -- and still does -- to colors ranging from light blonde to yellow, tan or even russet. If you're looking for a teddy bear hamster that is one solid color, you'll find a variety to choose from. In addition to varying shades of gold, long-haired hamsters can sport coats of black, white, dark grey or brown. It is possible to find a hamster that has only one color of hair, but most have white on their tummies even if the rest of their fur is solid. The majority of teddy bear hamsters you'll find are a patchwork of two or more colors. The combinations may be either white with gold, black, grey or brown, or a mixture of any or all the colors except white. Panda hamsters are those that have the typical black and white markings of a panda bear, and calico teddy bear hamsters have colorful markings of russet, grey, black, gold and white just like those you see on a calico cat. You fell in love with your teddy bear hamster because of his adorable coat and his sweet little personality. Even if the color of his hair isn't what you were looking for, don't go trying to change him. It's not safe to color a teddy bear hamster's hair, so love him the way he is. Because his hair is so long, though, he can benefit from a little help in the grooming department. Teddy bear hamsters are all OCD about bathing, so you won't need to give him a bath -- in fact, don't except upon veterinary consultation. Wood shavings and bits of paper bedding can easily become stuck long-term in a hamster's hair if it's wet. 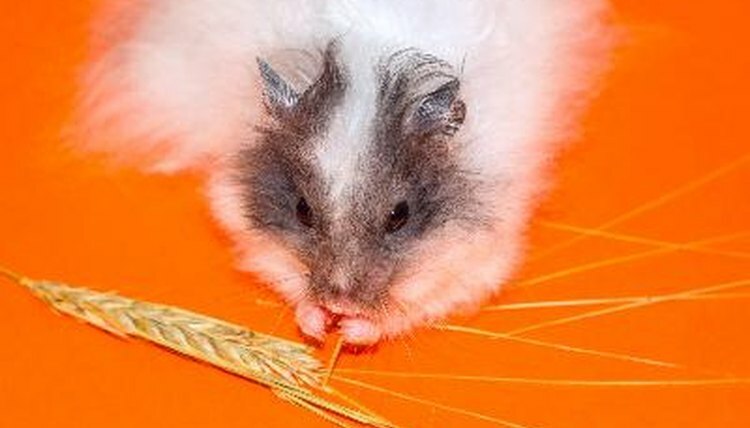 Spend some quality time with your little guy gently brushing the tangles and debris out of his hair with a soft-bristle tooth brush, and you'll have one well-groomed and happy hamster.